“A dish that contains the essence of the sea,” writes Catalan author Manuel Vázquez Montalbán of this unique Catalán fishermen’s preparation, which cooks toasted noodles in a flavorful fish broth until they are crispy on top but still soft and juicy underneath. A bowl of garlic mayonnaise is served on the side. Scrub the clams and mussels under cold running water. Place in a bowl, cover with lightly salted water, and soak for 20 minutes. Drain, rinse, and keep cool until ready to use. Stem and seed the dried pepper and tear it into pieces. Soak in a small bowl of hot water until soft, about 5 minutes; drain. Peel the shrimp, reserving the shells. Season the shrimp lightly with sea salt, cover with plastic wrap, and refrigerate until ready to use. 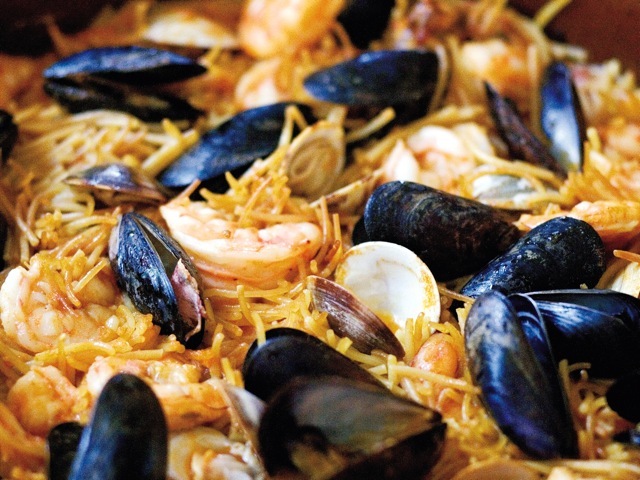 Place the shrimp shells in an 11- or 12-inch Spanish cazuela and set over medium heat. (If using an electric or ceramic stovetop, be sure to use a heat diffuser with the clay pot.) Add 2 tablespoons of the olive oil and 3 of the whole garlic cloves and cook until the shells turn pink and the oil smells aromatic, about 5 minutes. Add the onion, grated tomatoes, and New Mexico red pepper. Cook until all the excess moisture evaporates, about 30 minutes. Season with the paprika, 1 teaspoon sea salt, and ¼ teaspoon black pepper. Press through a sieve back into the cazuela. Place the almonds in a blender or food processor. Add the contents of the cazuela and 1 cup water; purée until smooth. Return to the cazuela. In a medium conventional saucepan, warm the fish glaze with 2 quarts water to make a fish stock. Add 7 cups of this fish stock and the saffron to the cazuela. Bring to a boil over medium heat, reduce the heat slightly, and simmer for 15 minutes. Preheat the oven to 350 degrees. On a jelly-roll pan, toss the fideos in the remaining 3 tablespoons olive oil. Bake for 5 minutes, or until golden brown. Remove the noodles from the oven and toss them to keep from browning too much. Raise the oven temperature to 400 degrees. Add the toasted noodles to the cazuela; press them down gently until they are submerged. Scatter the clams, mussels, and shrimp on top. Set the cazuela in the middle of the oven and bake until the shellfish are open wide and the fideos crusty on top and moist and tender within, about 10 minutes. Remove from the oven and let stand for about 5 minutes before serving right from the cazuela. Pass a bowl of garlic mayonnaise on the side.